JHP Fasteners’ inventory of electronic fasteners includes high quality spacers and standoffs for all applications. 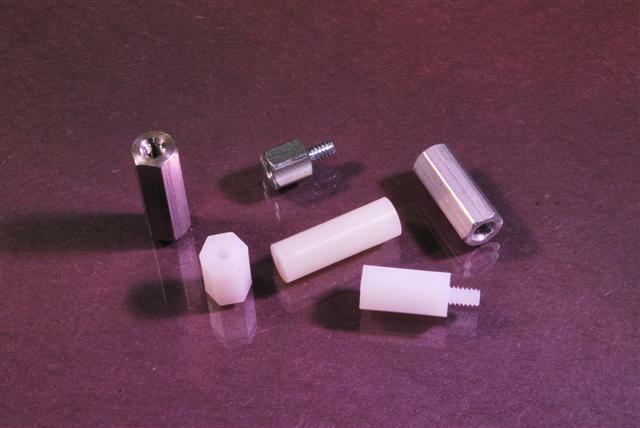 These fasteners are available in a range of sizes, materials, and configurations to meet your unique requirements. If you don’t see the electronic spacers or standoffs you need listed in our inventory, or are unsure of which fastener is right for your needs, please contact us—we’re here to help! Spacers are designed for use with PCBs (printed circuit boards), panels, enclosures, and other sensitive electronic devices in just about any electronic configuration imaginable. They are frequently used for PCB to PCB or chassis to PCB connections. They can be installed over screws and between components because all our spacers are unthreaded. JHP Fasteners has quick access to round and hexagonal electronic spacers in numerous standard lengths (heights) and diameters (O.D. and I.D.) to meet your specifications. Inch and metric options are available as well as custom lengths on request. A range of different materials is also available—we offer spacers in aluminum, stainless steel, mild (carbon) steel, brass, and nylon varieties. Select materials can be coated or plated, as needed. Please see individual product listings for additional information, or contact JHP Fasteners to learn more. Standoffs are standard equipment for PCB mounting and other electronics applications that require spacing between components. We stock standoffs for both regular and heavy duty operations. JHP Fasteners offers round and hexagonal female/female standoffs, and hexagonal male/female standoffs. An array of standard lengths (heights) and diameters (O.D. and I.D.) are available to match your specifications. Inch and metric options are available as well as custom lengths on request. Electronic standoffs are available in numerous materials: mild (carbon) steel, stainless steel, aluminum, brass, and nylon. Select models can be coated or plated, as needed. Please see individual product listings for additional information, or contact JHP Fasteners to learn more. We invite our customers to take advantage of 45 years of extensive industry experience and expertise. Based on your input, we will be able to provide you with the expert guidance needed to select the ideal electronic spacer or electronic standoff to meet the needs of your specific application. Superior customer service, a large, ready-to-ship product inventory, and highly competitive prices are just some of the many benefits of doing business with us. Contact JHP Fasteners today for more information on our electronic spacers and standoffs.